I'm trying to follow focus in on using some of my make up, up. 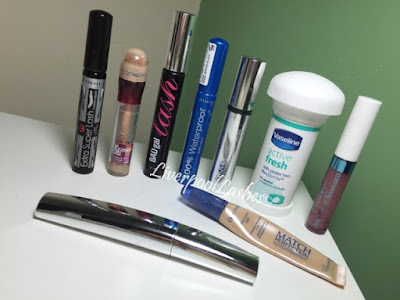 It's very easy to accumulate a lot of products that you didn't like very much and therefore overlook so I needed to get rid of them, particularly as quite a few of them were mascaras. There is three mascaras is here that I do not rate to toll and they are Rimmel Rxtra Super Lash, Rimmel 100% Waterproof and MUA Extreme Curl. To me they're all as equally bad, they literally just coated my lashes to make them black and I seriously do not recommend any of them. In a nutshell sometimes the reason why you've never heard of a product is because it's rubbish. Two good mascaras are Benefit Bad Gal Lash which I wore for my wedding and Clinique's mascara. The only thing I'd say about the Clinique one was that it seems to develop a horrid smell fairly quickly. I do think that the Maybelline Eraser is truly fantastic if you don't mind the sponge tip. It was good at concealing my dark circles and seemed to last a long time. This would definitely be something I'd repurchase. On the subject of dark circles, Rimmel Match Perfection concealer is something I've purchased time and time again. It conceals and highlights to the point where as I tell everyone to buy that over the YSL Touché Eclait. Vaseline Active Fresh is a bit of a random empty but I probably wouldn't repurchase it. It came up like a cream to spread on and I just didn't like the application although the scent was nice. Last but not least is the Miss Sporty Clear Mascara which I bought for my brows. Unfortunately this mixes with your other brow products to get an unattractive look and since the Maybelline Brow Drama is so fantastic, I wouldn't consider buying this again!